Growing this as an espalier at holiday cottage in Normandy. 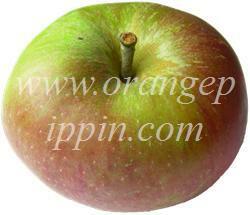 In its 4th season has cropped heavily with large disease-free fruit. Early impressions from my tree suggest that it has good resistance to mildew and scab (Eastern UK). Its resistance to canker, as a guess, seems about average, so far. The tree certainly doesn't appear to be of the kind of vigour that would normally be associated with "T3" (vigorous) types; my tree is growing at only an average or slightly above average rate. It also seems to be surprisingly bushy, dense and compact at the moment, with quite large leaves, although it is still quite a young tree and may change as time passes. Branches seem quite flexible, so would be consistent with its reputation for being a spreading tree (i.e. bending under the weight of fruit). At the moment, I suspect that it will turn out to be one of those varieties which grows at about average rate, but, like some other old types (Ashmead's Kernel, Worcester Pearmain, Belle de Boskoop) if left unpruned, tends to just keep growing at a steady pace for all of its life, eventually making a large tree while its companion trees have long-since matured and ceased to show much growth. 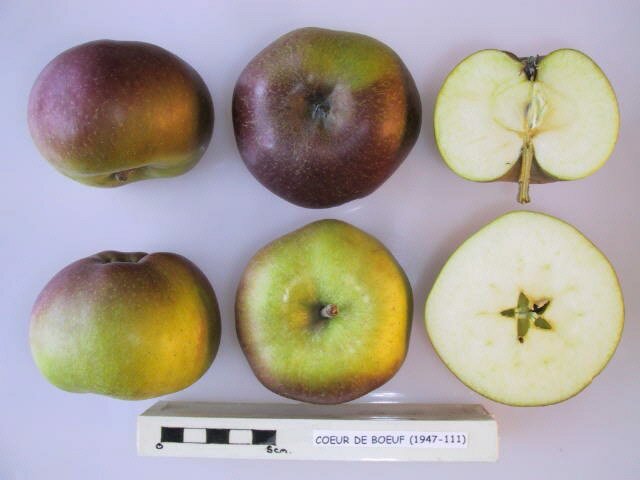 Having had the opportunity to observe and take notes on many apple varieties over the years, I have (an unproven - just "gut feeling") suspicion that Coeur de Boeuf might be triploid, or might have some other abnormal chromosome number which might make it a poor pollinator of other varieties.